Looking out for our planet as well as your wallet, Epson have created a new way of printing with the T7741 Ecotank Ink Bottle. Producing an impressive 6000 pages per bottle, Epson are responsible for a new generation of ink cartridges compatible with the Epson Ecotank printer range. The T7741 Ink Bottle produces high quality text and images, and is capable of printing your family snapshots on glossy paper as well as your latest business report. 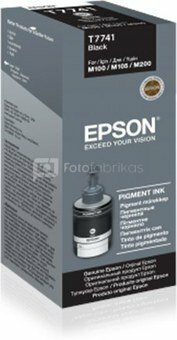 Environmentally friendly and easy to use, the Epson T7741 Ecotank Ink Bottle will produce outstanding, crisp prints.